First of all I would like to say thank you to all my readers - I received a very positive feedback after I published the first part of my initial impressions after the first 2 months of living in the US. Here is part 2, where I continue covering various topics related to what I find interesting, strange, and amusing here in the US based on my international experiences. I've briefly covered climate in my opening remark of part 1. But what surprised me most here is a notion of micro-climate. I haven't experienced anything remotely similar to this. San Francisco is located next to the ocean. And climate there is affected by the ocean a lot. But the more you move away from the ocean deeper inland the climate becomes more continental (hotter in the summer and colder during the winter time). The Bay Area is also surrounded by the hills, which act like walls in some way isolating this area from the large atmospheric flows. This is all normal (ocean is a huge heat accumulator after all) but what makes it fascinating is the extremely short distances (in my view) where we can observe large temperature variations. I have seen it several times when driving 15-20km towards San Francisco - the temperature would drop by 15 degrees. I am wearing a t-shirt in a car and wondering why people in SF are wearing jackets. This is truly a MICRO-climate. Another impressive weather feature over here is fog. Fog is very common around SF and quite often it spreads deeper into the Bay Area crawling at the bottom of the valleys between the hills surrounding this area. Back to the cars ;) Most of the cars are equipped with the radios capable of receiving SiriusXM. These are radio stations delivered via a satellite. Lots of stations to choose from, good sound quality but requires a paid subscription. Without it you are only getting a demo channel. When you start a car here all (most?) 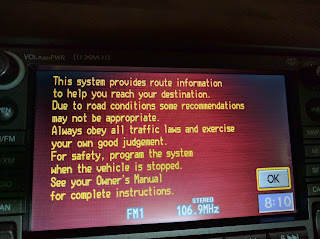 of them display an annoying warning/popup (before you can start using the navigation screen). The signs of a country run by the lawyers - no one wants a liability. Paper money. After 12 years in Australia I was so used to plastic banknotes that returning back to paper based banknotes felt strange. From the longevity and usability perspective I am a big fan of plastic banknotes. You can have hundreds of TV channels here in the US. There are different packages - some of them containing 500+ TV channels. But it is hard to find anything interesting to watch - especially if you have one of the basic packages only. You get a bunch of news channels, a few sports channels (ESPN, TNT - where one can occasionally catch a good game of basketball), lots of religious channels... There is even a special channel for dogs! Apparently "Scientifically developed. Pup approved". You can watch some local games (Raiders, Warriors) but if you follow a different team - tough luck! They will tease you in the TV guide but then you will quickly discover that these games are "blacked out" in your region. If you want to watch proper sports you will need to buy a special package to watch NBA or NHL games. Same applies to movies - you will need CINE or HBO to watch anything decent. And if you combine a few packages together it can become quite expensive. In regards to the news channels - Fox News has a strong bias/support towards the Republican party (right, conservative party), while a whole bunch of other channels (ABC, CNN, NBC) have a tendency to support Democrats/Pro-liberals more. It was amazing to watch the elections campaign and switch between the channels to see the same issue being presented from the totally different angles. Guns. Where do I even start?! And this is the foundation that gives individuals the "right to bear arms" (i.e. to legally own guns). Gun ownership is very common - spearheaded by the powerful NRA (National Rifle Association) lobby. 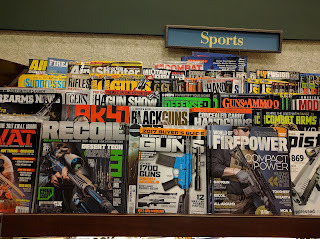 You can even judge this by this photo I took in the bookshop - SO many gun related magazines! 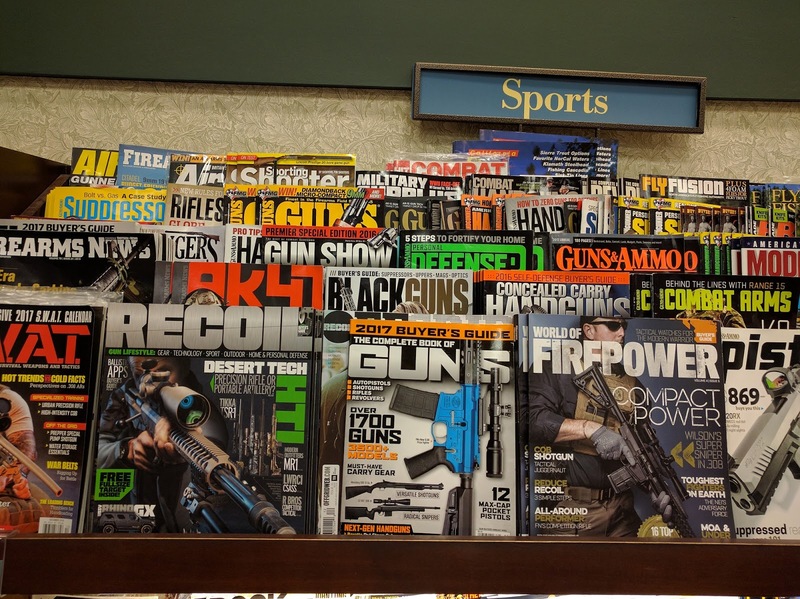 There are 2 types of licences - Concealed Carry (where a gun should not be visible to the public - in some cases even partially including a contour of the weapon in the back pocket) and Open Carry. I've heard an interesting consideration - if you carry a gun visible to anyone in (say) a shop and robbers enter/target this shop - who are they going to shoot first? Correct - a person carrying a gun. Shootings in public places (especially schools) are terrifying. Teenagers (sometimes as a response to bullying) shoot their classmates. Some people would say "how come that guns are so accessible to kids" while others would complain "if only a teacher had a gun to take down the shooter faster to reduce the number of victims"
In essence, the logic goes like this - if the bad guys can have guns, what can we do about it to protect ourselves? In many other countries the answer is naturally to limit the accessibility of various weapons to make it harder for the criminals to gain access to those weapons, to have better policing and to prevent weapons from being stolen from the policemen, etc. In the US it is the opposite - in order to defend yourself against people with weapons you need to have a weapon too. "God may have made men, but Samuel Colt made them equal"
This is a very divisive and contentious issue - on one side pro-gun groups like NRA and Gun Owners of America push for more lenient gun ownership laws while groups like The Brady Campaign and The Coalition to Stop Gun Violence advocate for much stricter rules. My observation is that republicans are generally more pro-gun while democrats are usually more inclined to favor more gun controls. I remember watching the local (!) news in Miami last year for a week and (I am not exaggerating) - every single day they were reporting shootings. This sounds very normal for the Americans but this is WAY too crazy for most of the foreigners including myself. Multiple shootings each day! And this is only one city. Unbelievable. Ok, let's talk about something different now. Sales tax is not included in the displayed price. Coming from Australia I find this being crazy and unfair to the consumers. I really like the fact that in Australia you pay the amount displayed. Also I like that in Australia price tags (in addition to the full amount) display price per unit (e.g. price for a liter, 100g etc) - this makes it easy to compare various packages of different size/volume. Square. It is a simple magstripe card reader. Square credit card payment processing system is used by many small businesses here in the US. Any business owner can go to the Square web site and request a free reader. It can be inserted into a standard 3.5mm headset jack (both iOS and Android phones are supported). It is simply brilliant. Cards can be processed anywhere (there is even an offline mode). Customer can sign with their finger on the phone screen. Square charges 2.75% per swipe. Absolutely brilliant in its simplicity. Crazy lane splitting. I've seen bad lane splitting in Australia too. Lane filtering is allowed in Australia (when cars are not moving at all or move slowly with the speed below 30km/h). Lane splitting (i.e. speeds higher than 30km/h) is illegal in Australia. It is also illegal in all US states except California. What I've seen here in California is plain crazy. You can drive on a freeway at 65mph (~105km/h) and be passed as if you were stationary by a motorcycle, driving between the lanes navigating around cars at crazy speeds. Surely they feel a lot of air turbulence and changing conditions passing cars at that speed. I understand the appeal to beat traffic but this is a dangerous practice in my view. I would like to wish Merry Christmas and a Happy New Year to all my readers. Square is also being adopted in Melbourne - you can buy them at Officeworks. It's not uncommon to enter some of the hipster cafes and see nothing on their bench except a Square contactless card reader. I'm not even sure how they accept cash (there doesn't seem to be any registers...). Motorcycle riding in the US is crazy in general. I recently developed a keen interest in motorbikes, and I have to say that the US has some pretty strange rules. For example, I heard that you can do basically whatever you want (wheelies included), as long as you are "maintaining effective control of your vehicle." I've also seen YouTube videos where a motorcyclist refuses treatment after a major collision because he can't afford it. Just really strange stuff... From what I understand, though, motorbikes are perceived as a recreational vehicle rather than something people actually use for transport. Hi James, thanks for stopping by! Haven't seen Square in Melbourne - it's great that this type of innovative technology makes its way to Australia.